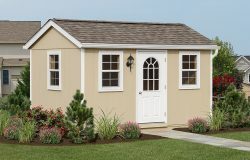 As the weather begins to get warmer, people spend more time outdoors in their backyards to entertain and enjoy the beautiful weather. 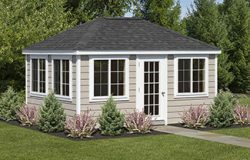 Backyard pergolas are the perfect focal point for any outdoor space. These spaces are great to host friends and family or to provide a romantic setting for a moonlit dinner with that special someone. 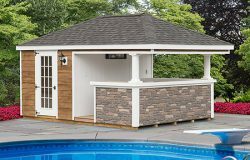 Transform your outdoor grilling area to an elegant oasis by purchasing a pergola and customizing it to fit your personal style. 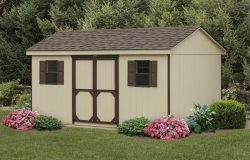 When shopping around, be sure that you choose a pergola style that will look appropriate in your backyard. 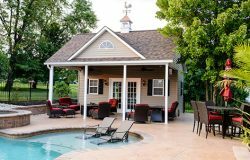 Many times, people add lights or curtains to these structures to incorporate their own flair into their pergola, customizing the look to their liking. Adding an architectural centerpiece to your garden and letting vines intertwine with the structure provides a rustic touch. 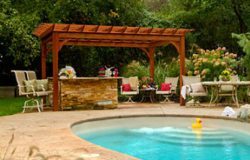 Some decide to put a pergola near a pool area to provide a shaded spot for swimmers to relax and dry off. Others attach it to the back of their home to close in a patio area. 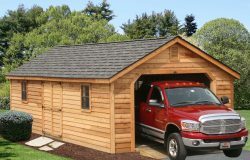 Wherever you put it, a pergola can be the perfect outdoor retreat for your property. 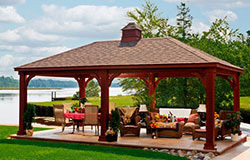 There are many pergola designs to choose from. 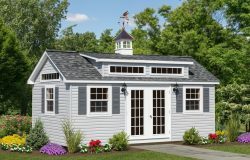 The Hearthside design provides a rounded roof that’s perfect to hang paper lanterns from, adding additional mood lighting for nighttime entertaining. 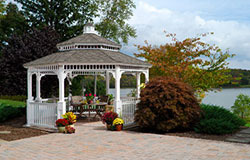 Baskets can be hung from the roof of this structure, adding a beautiful touch of floral color to the outdoor pergola. 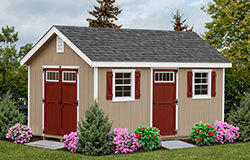 The Heartland design provides notched intersections, a post skirt, and 3-piece arched joints. 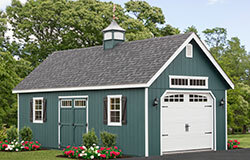 Wood artisan pergolas have notched intersections, anchored brackets, and double ply headers and trim at the top. 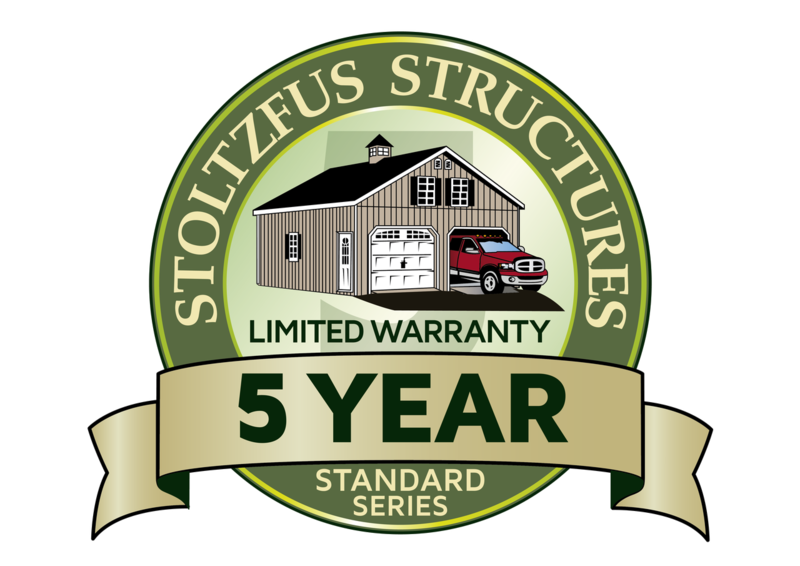 These artisan-style pergolas are also offered in vinyl materials as well, offering maximum versatility to your backyard. 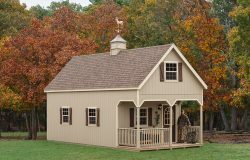 The artisan vinyl pergola includes scalloped ends, a decorative post base, and a decorative capital and trim. 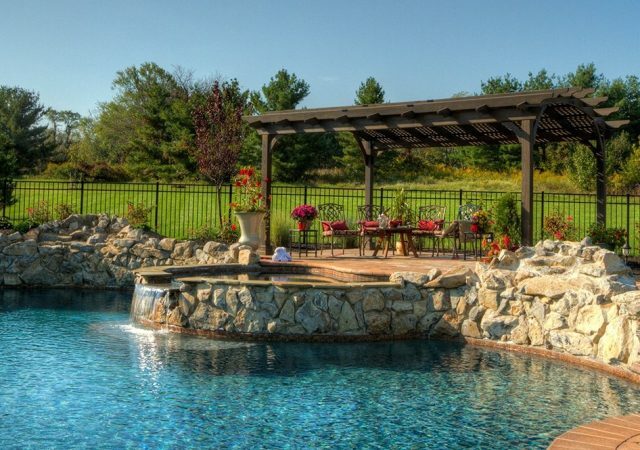 If you can’t find the style you like or want for your outdoor space, you can always design and order a custom pergola to fit your needs! 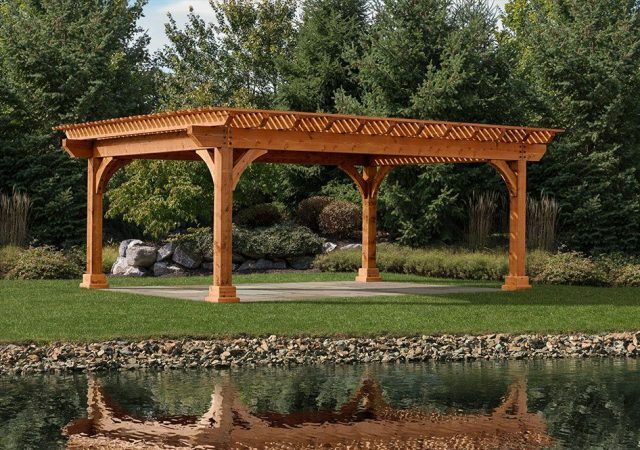 With many options in design, pergola styles can be enhanced to help you maximize the investment in your outdoor living space. 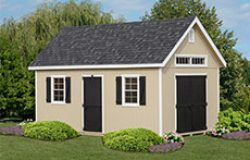 For instance, stone columns can be added to enhance the visual appeal of your backyard entertainment space. 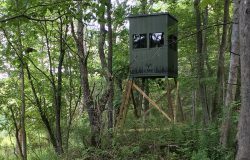 Add a privacy wall to one or more sides of the structure to block wind and create a more intimate setting. 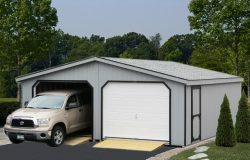 A lattice roof can be implemented to provide increased shade during those bright and warm summer days. The additional wooden slats allow less light to pass through and provide coverage to people sitting underneath. 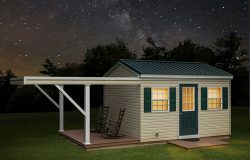 To take your structure to the next level, an electrical package can be added to your pergola so that lights and other electronic devices can be plugged, making your space a true outdoor oasis. 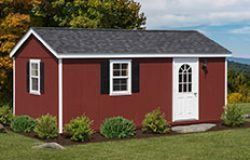 These attractive and useful structures can be made from quality wood and vinyl materials in many stains and colors to match the rest of your backyard. 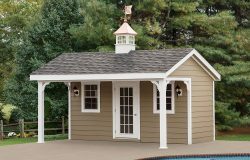 Wood pergolas are available in cedar, canyon brown, cinder, and mahogany stains and are waterproofed to protect against the elements. 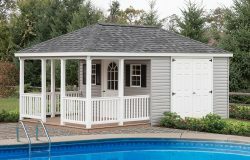 Vinyl pergola materials are available in a basic white or an ivory color. 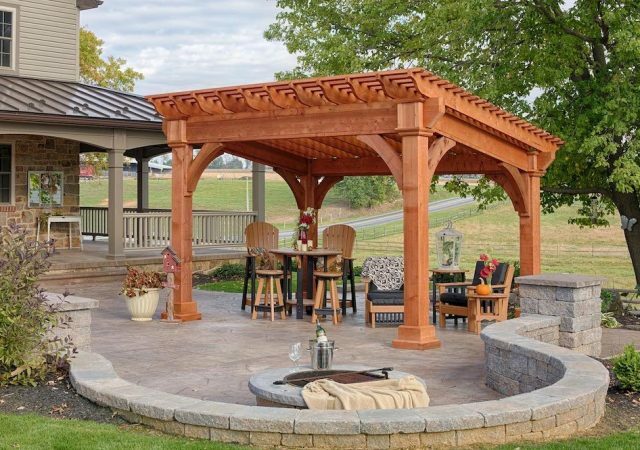 Whatever you decide, an outdoor pergola is the best way to transform your backyard to the ultimate entertaining area!